Thinking about getting a life coach? If there is a gap between where you are in life right now and where you would like to be, then you could benefit from life coaching. There is no need to try so hard all alone, when you can obtain your life goals in much less time with the help, structure, and methods of an experienced life coach! Individuals who work with a life coach want more out of their lives, desire personal growth, and want their lives to be easier. Life coaches facilitate all three without delay. A life coach can help you get where you want to be, but also help you overcome your belief system that is limiting you and help you go even further! Executives, business leaders, entrepreneurs, small business owners, government employees, artists, actors, musicians, professionals, managers, underemployed, and unemployed all benefit from a life coach. A Public Management article described a study comparing the effects of training by itself with a combination of training and life coaching. Training by itself increased productivity by 22.4% but a combination of training and life coaching weekly increased productivity by 88%. Successful people benefit from seeing a life coach. A life coach can help connect you to the things you most enjoy. Life coaching can also help people who are struggling and finding life difficult. No need to tolerate the intolerable. A life coach help you get financial freedom, fulfill your goals, and get more out of life. A life coach can help accelerate the change that you want. Successful people like CEO’s, business leaders, performers, and athletes don’t go it alone. They appreciate the need for an experienced professional to help them evaluate all the possibilities and formulate a plan, while providing feedback and support. Achieving greatness is impractical without this help. Olympic athletes rely on their coaches to help them compete. The coach provides the added advantage making winning possible–the coach makes the difference. Life coaching offers a foundation of support. Many of us begin projects with solid plans but without help once we encounter the first obstacle, it totally disrupts our progress or at least leads to a delay. With the help of a life coach, the obstacles can rapidly be overcame so the person can get more done while not having to work so hard. More appropriate goals are made that effortlessly inspire the client into action. Synergistic relationship between the client and life coach generates passion and momentum. The client learns new skills, paving the way for larger victories. Michael Halyard is now available for life coaching. You can email me now at lifecoach@sftherapy.com or call me at (415) 642-4662 for more information or to set up an appointment. As your partner dedicated to your personal growth, my goal is to propel you to the next level. Life coaching is a collaborative relationship between a client and life coach with the goal of unlocking your full potential. Like Olympic athletes who wouldn’t consider training without the additional impassioned support and objective insight of an athletic coach, many of the most successful contemporary leaders, professionals, and entrepreneurs make use of a life coach to propel their careers or lives to the next level. Life coaches are part adviser, part motivational speaker, and part counselor. Life coaches help professionals, business leaders, and ordinary people define and accomplish their goals in their personal or professional life. Life Coaching is practiced with individuals who are already functioning at high level, but they want to push themselves beyond a very difficult challenge. Life coaching is also used to help individuals break free of targeted negative patterns that seem resistant to change. Life coaching concentrates on the “here and now” of the targeted behavior. The focus is to convert self-awareness into real change. The coach provides encouragement and guidance towards the individual’s personal goals. Like psychotherapy, the relationship is personal and confidential. Life coaching has the goal of helping clients identify and fulfill personal and professional goals. Although life coaches may also be trained as a psychotherapists or have a background in psychology, psychological interventions are generally not involved in life coaching. 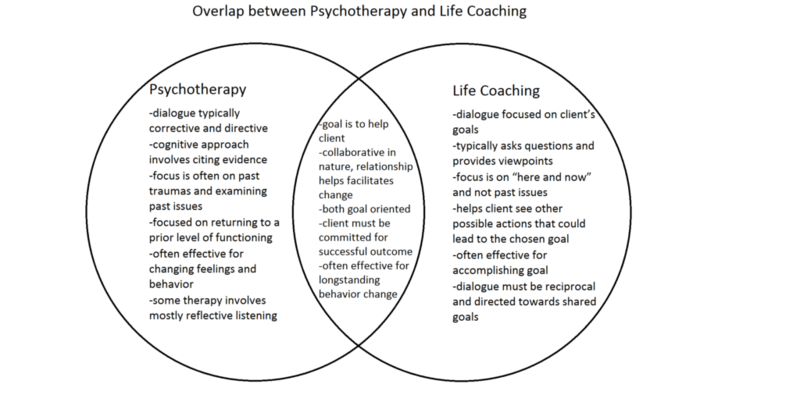 There is overlap however between life coaching and psychotherapy. Life coaching and psychotherapy both employ knowledge and understanding about human behavior, interpersonal techniques, motivation and behavioral change; however there are clear differences in the approach, focus, goals, and amount of professional responsibility assumed by a life coach verses a psychotherapist. Psychotherapy diverges from life coaching in that psychotherapy is a professional health care service where the psychotherapist is responsible for identifying, diagnosing and treating psychiatric disorders. Psychotherapy is a better approach for people who are having difficulty functioning in day to day life or have a diagnosed mental illness. Life coaches don’t focus on issues from the past or childhood traumas. If an unresolved past issue gets in the way of your progress, most life coaches will refer you to a psychotherapist to address the issue. If the life coach is also a psychotherapist, then you can address it in your life coaching session but it is generally not the main focus. Having unresolved traumas prevent the client from achieving their goals is a common problem. Rather than focus on the past, the focus of life coaches is on the present and goals for the future. Life coaches assist clients to move forward with their lives, and help them make goals for their personal and professional life that will manifest the life they want. The majority of life coaching clients are successful, productive, healthy people who may be stuck in their lives, or desire to make a significant change, and want the help of their own individual life coach to help them follow through and achieve their desired outcomes. Sees clients as complete, creative and resourceful. You begin to make more focused and constructive steps towards your goals instantly. You build momentum so reaching your goal comes more naturally. You find yourself having more energy and time for accomplishing you goals and for leisure. -You make more relevant goals built around your true desires. You no longer have to endure frustrations over small obstacles. Verbal approach: A professional life coach is trained to say the right words to keep you motivated. A skilled life coach doesn’t need to nag or intimate to motivate. Life coaching is most effective when the coach and client make weekly calls. Weekly calls give clients sufficient time to incorporate new ways of looking at things and taking action steps weekly towards accomplishing their goals. Life coaching is often provided over the phone in half hour or hour long life coach calls. Clients tend to look forward to their telephone appointments each week as they are thought-provoking and inspirational. Expertise: A professional life coach has the training and expertise to help you make the right goals and action steps to reach them. A life coach can help you to structure your life so you can be more productive with less effort. With the help of a life coach, you can accomplish more in less time. Accountability: Clients are better able to follow through with their action plan when they are accountable to a life coach. A life coach can help clients be accountable through contact in sessions, but also by weekly check- ins over the telephone or texting. Regularly scheduled check-ins helps motivate clients to follow through and get more done than if they were left on their own. A good example of how a coach makes a difference is the effect of a personal trainer. When you use a personal trainer at the gym, you work out much harder than you would on your own. Clients think big, set larger goals, and work harder towards those goals when they are working with a professional life coach. Rapid change: Change tends to happen quite quickly for most clients who use a life coach. Life coaches help with professional, business, and personal goals. A life coach is prepared to help you with all areas of your life. Frequently, if there is a distressing issue at your job, it impacts your home life and vice versa. Different clients choose to use their time concentrating on their personal goals while others choose to concentrate on their professional goals. The client decides what they want to focus on for their life coach work. Every life coaching client is different and has different goals and different impediments to achieving those goals. I can help turn your ideas into concrete goals and help prioritize them. The client’s goals become the goals of the life coach for that client. I work with clients to create an action plan and I will have suggestions for reaching the goals rapidly. An action plan is a blueprint that identifies the steps that need to be taken so that a particular goal can be achieved. The objective of an action plan is to detail what resources are needed to obtain the goal, and to create a schedule for when each individual task needs to be completed in order to obtain the goal. I will continue to ask questions about the best way to proceed, and figure out the best ways to keep the client motivated. For some people to be more effective in achieving their goals, personal work may be necessary which could include assessments and questionnaires. Generally clients work with me for a few months up to a year, but they can always return when the need arises. The average time commitment is for three months. Sometimes clients stay longer as they are surprised what a major difference life coaching is making in their lives. The minimum commitment required is one month, and clients can continue month to month. I usually meet with the client twice each month in person, and have two to three phone appointments so that there is accountability each week. Please contact me if you have questions or would like to set up an appointment. During the initial phone call, we can talk about what you’d like to work on. Once we have our first appointment, we will develop a preliminary action plan.